Versitle bird repeller combines visual & sound repellents. 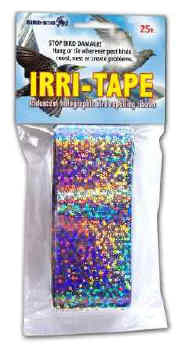 Irri-Tape “flashes” when it reflects light, producing constantly changing colors and patterns-an unsettling danger to birds. Sound deterrent: pest birds are “rattled” by the fierce metallic noise. Holographic bird tape flashes blinding light & makes noise when it flaps in the wind. This multi-sensory attack scares birds away from the treated area. Also known as Flash Tape, Foil Tape, Bird Tape, Repeller Ribbon, Mirror Tape, Reflective Tape, Mylar Tape, Holographic Tape, & many others, this product has been used for years. Bird tape is often used in farms, vineyards & other agricultural applications.